It’s the mid-1960s, and everyone is fighting back. Black Americans are fighting for civil rights, the counterculture is trying to subvert the Vietnam War, and women are fighting for their liberation. Indians were fighting, too, though it’s a fight too few have documented, and even fewer remember. 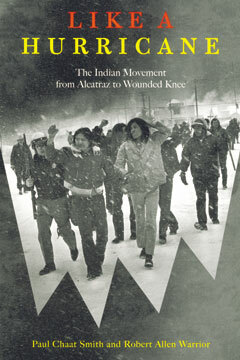 At the time, newspapers and television broadcasts were filled with images of Indian activists staging dramatic events such as the seizure of Alcatraz in 1969, the storming of the Bureau of Indian Affairs building on the eve of Nixon's reelection in 1972, and the American Indian Movement (AIM)–supported seizure of Wounded Knee by the Oglala Sioux in 1973. Like a Hurricane puts these events into historical context and provides one of the first narrative accounts of that momentous period. Unlike most other books written about American Indians, this book does not seek to persuade readers that government policies were cruel and misguided. Nor is it told from the perspective of outsiders looking in. Written by two American Indians, Paul Chaat Smith and Robert Allen Warrior, Like a Hurricane is a gripping account of how for a brief, but brilliant season Indians strategized to change the course and tone of American Indian–U.S. government interaction. Unwaveringly honest, it analyzes not only the period's successes but also its failures. Smith and Warrior have gathered together the stories of both the leaders and foot soldiers of AIM, conservative tribal leaders, top White House aides, and the ordinary citizens caught up in the maelstrom of activity that would shape a new generation of political thought. Here are insider accounts of how local groups coalesced to form a national movement for change. Here, too, is a clear-eyed assessment of the period’s key leaders: the fancy dance revolutionary Clyde Warrior, the enigmatic Hank Adams, and AIM leaders Dennis Banks and Russell Means. The result is a human story of drama, sacrifice, triumph, and tragedy that gives a ground-level view of events that forever changed the lives of Americans, particularly American Indians. Paul Chaat Smith is a Comanche author, essayist, and curator. He lives in Washington, D.C.